At the heart of Asheville, North Carolina's downtown, Lexington Avenue serves as a creative corridor, something of a distilled version of the city itself. It could almost be called Asheville's small entrepreneur or specialty shops district, offering an eclectic mix of more than 200 small businesses and shops ranging from fashionable retro boutiques to a brewpub. Izzy's Coffee Den and Dobra Tea offer shoppers respite, places to refresh and refuel with the city's distinctive laid back funky vibe. Tops for Shoes is a statewide shopping destination. Lexington Avenue runs from the I-240 viaduct to Patton Avenue through downtown Asheville. Along Lexington Avenue, old warehouses and offices have been converted into restaurants, bodegas, and galleries. There are freshly painted markers for shared roads and wayfinding signs to help people get around. Photo City of Asheville. But there's more. In addition to Lexington Avenue Brewery (LAB), the stretch features two modern-day "speakeasies," Nightbell and Lex 18, both of which specialize in craft cocktails, including moonshine-laced concoctions. Unique independent restaurants fill the tapestry of the spaces in between. Back to the shopping and the vibe of the street, it's a diverse offering: You can go antiquing at two shops, dive into a treasure trove of beads at Chevron Trading Co., or engage in a little retro vinyl music hunt at Voltage Records. Plus there's a bookstore. At street level, Lexington Avenue is lined with beautiful brick sidewalks that are complemented by the street trees dotting this urban thoroughfare. The tree canopy helps to reduce heat in the summer months, curb pollution from stormwater runoff, provide habitat for birds in the city, and create a leafy downtown shopping experience. In the early 1980s, local activists fought to prevent much of Lexington Avenue from being razed to make way for a shopping mall. Now it is a reinvigorated and bustling center of local culture. Photo City of Asheville. Lexington Avenue is a funky, creative, and delightfully unexpected home to a bustling music and arts scene that plays a crucial role in supporting Asheville's economy. Lexington Avenue is part of the fascinating economic and social history of downtown Asheville. For many years, the area was a site of neglect with many abandoned buildings. Some officials and developers in the late 1970s offered the idea of buying a large, 11-block swath of land in downtown and converting it into a mall. After a series of contentious, highly publicized debates centered on a needed bond referendum, the people of Asheville voted against the project by a margin of 2 to 1, and the city moved to find other ways to reinvigorate downtown. 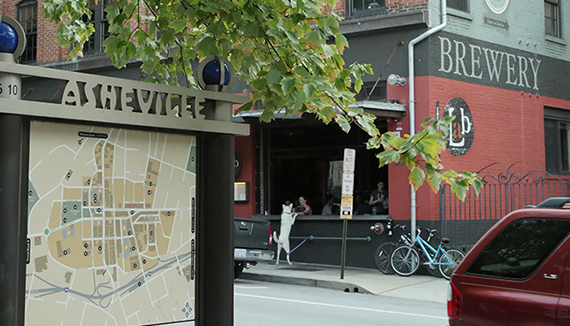 Through dedicated revitalization efforts and redevelopment strategies, Lexington Avenue and other parts of downtown Asheville are now celebrated for their diverse economies that drive a large tourism industry. Lexington Avenue offers a pedestrian atmosphere within the bustling downtown Asheville setting. 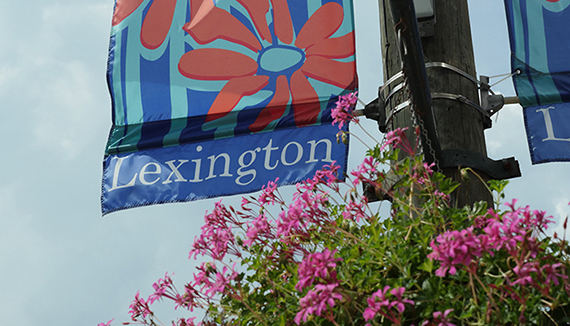 Numerous shops and restaurants, combined with galleries and other uses, make Lexington a destination street nestled between the busy thoroughfares of Broadway and College Street. The city has also worked to incorporate bike lanes and on-street parking into the existing right-of-way, and added street trees, benches, and details like planters and lighting fixtures to amplify the avenue's character. The City of Asheville has in recent years used comprehensive planning as a tool to facilitate smart-growth style development in downtown, including the Lexington Avenue area. There are many examples of planning supporting the street and its tenants and visitors. The Asheville City Development Plan 2025 adopted in 2003 is unique in that it contains a New Urbanism charter and directly speaks to a vision to encourage features like higher densities, adaptive reuse, and infill development, among others. Promoting such policy through design is evidenced by other items such as the City of Asheville Pedestrian Plan (updated in 2005) and the Urban Walking Trail that features stops along Lexington Avenue. Additionally, the downtown was the subject of the Asheville Downtown Master Plan (2009), followed by the adoption of a hybrid zoning code (2010) to ensure and create incentives for compatible infill development. Lexington Avenue Arts and Fun Festival is a street festival that celebrates the creative flare that's concentrated on Lexington Avenue. The annual end-of-summer festival falls on the Sunday of Labor Day Weekend. Thousands come out for this special festival. Downtown After 5 Summer Music Series, held by the Asheville Downtown Association, brings residents and visitors to Lexington Avenue every third Friday during the summer months. Attendance is estimated at around 5,000 for this free event. Asheville Just 'Happened' to Develop a Nice Downtown—or Did It? The Downtown Issues Taskforce is a multi-departmental committee of city staff that meets monthly to consider and coordinate the safety, growth, and management issues of all of downtown Asheville. The Downtown Commission is an advisory body appointed by city council that meets monthly to coordinate downtown vitality efforts and recommend policy to city council. The City of Asheville expects to begin its comprehensive plan update process this year.